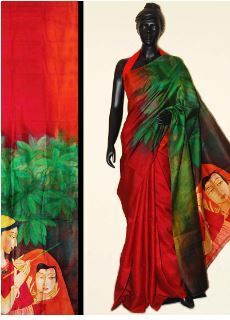 From resist dyeing to hand painting, there are so many means of making a colored impression on sarees other than a simple usage of a brush, which one associates with painting. The Indian tradition of saree painting goes back to traditional painting styles that used reverse painting, stamping, pen paintings as well as brush painting. Right from pictorial descriptions that one could find on temple walls to cave walls, there has been the replication of patterns down the ages on all kinds of fabrics and most of them seem to be a continuation of traditional arts such as Phad paintings, the Kalighat style of art, Madhubani, Kalamkari, Orissa Patta Chitra and Warli art. 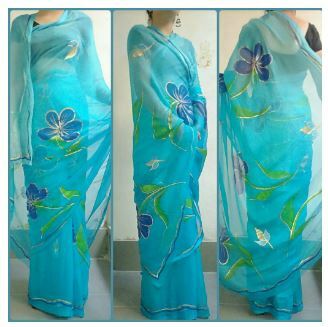 Wearing a saree that has been hand painted is like adding a new dimension to your personality, just like a piece of exquisite weaving, except the art is created with either brushes or pens. There, of course, has been an overwhelming influence of religion on such paintings. It has, however, seen a change ever since its more commercial usage. 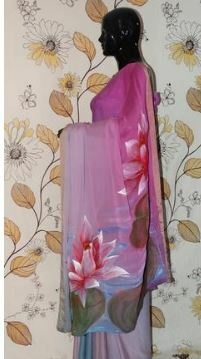 However, finding a great hand painted saree would also mean understanding what your wardrobe really requires. While some may love the look of rich gem colored colours of Phad paintings of Rajasthan, others may prefer more vibrant figures and designs in earthy natural colors seen in Kalamkari. 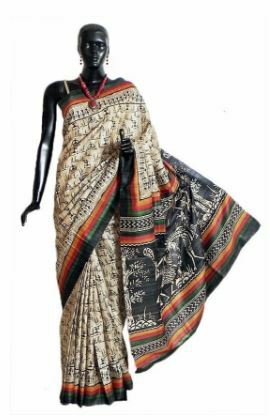 There may be few who instead prefer the fine intricacies that Madhubani designs bring out and many would love the huge numbers of abstract designs and floral patterns that have slowly made their way into fashion trends in sarees. 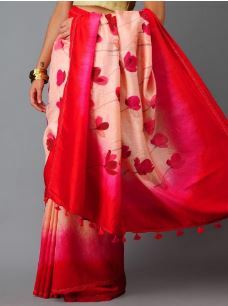 But there is no doubting the fact that hand painted sarees as a fashion trend is here to stay. So what would be the best that you could find in designs? For that, all you need to do is run through the lineup, which could be divided mainly into three categories-floral, abstract and traditional designs. Each suiting a variety of looks and personalities. 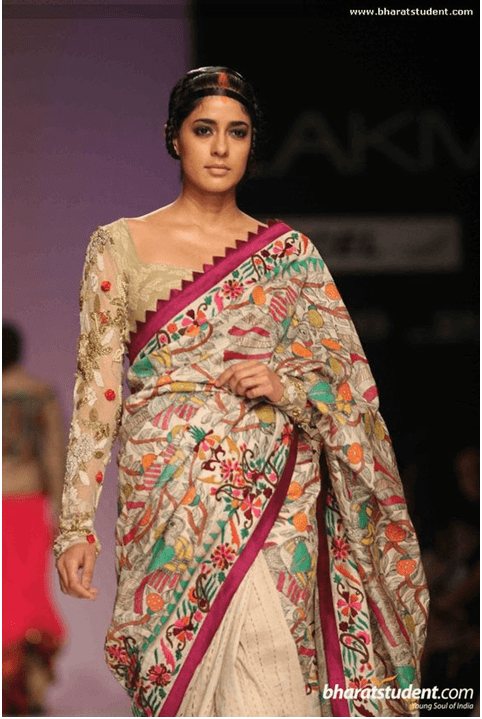 Floral patterns look best on the lightest colors of sarees and better still on white. The fabric as in the case of the one below could be plain white cotton, tussar or silk. The effect of the paintings, of course, will be affected by choice of fabric. Though it is safe to say that cotton and silks are the most skin friendly, but hand painted sarees have the best color resolution on sarees with a slight synthetic mix. The reason being that cottons usually allows colors to run or fade. 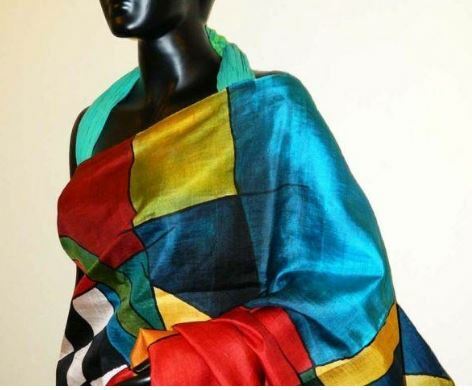 A perfect example of how a single pattern can be made to give such a lot of excitement in terms of design to a plain saree is evident in this gorgeous crepe silk. 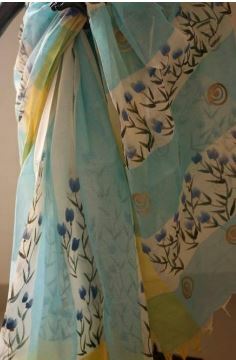 A similar floral pattern, but here is the style in which the maximum amount of motifs are painted in the frontage of the saree- meaning the portion covering the front that goes right up to the shoulder. 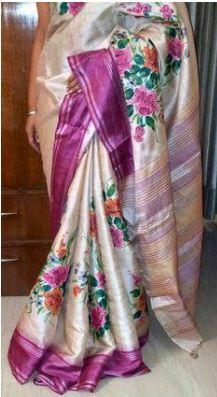 Note the florals continuing along the bottom of the pleats and the pallu with a dab of pale pink to give more highlight to the floral pattern. The dual tones of purple and mauve gorgeously collaborating with the pink and black makes this a stunning play of colors. Do note that florals need not always be delicate in their interpretation and can be done in a bold pattern along the pallu as in this saree. Take any broad linear patterned cotton saree and play around with florals in just one segment of it and there you have it-a simple pattern within a pattern! Well, when it comes to florals there is no hard and fast rule to match it with too much accuracy with real flowers, as there is ample scope of artistic freedom. Be it the shape of leaves, petals or their colors. Here are two sarees that are vibrantly hued with large floral motifs, yet the manner in which the simple flowers have been painted makes it all the more mesmerizing. Do note the usage of bright colors as a backdrop rather than the typical pale ones. A modern look at fabric painting has brought in a wonderful blend of rural ethnic themes that have nature-based motifs as well as human figures or spiritual theme of an eclectic variety. Buddha and Krishna painted on pallus have been quite a rage. 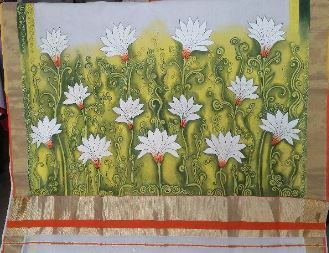 Here is another look at how the pallu can be made in a more traditional mural type of creation which is typically done on the Kerala cotton sarees. 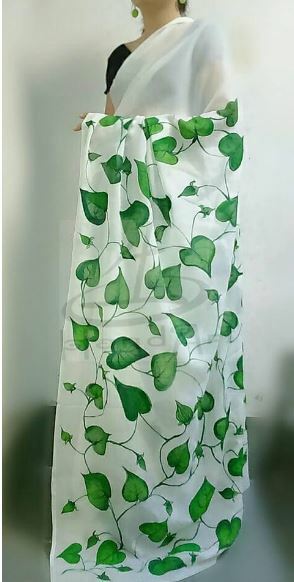 This pattern looks all the more stunning because of the white lotus arising out of a pond covered in spirals of green leaves. 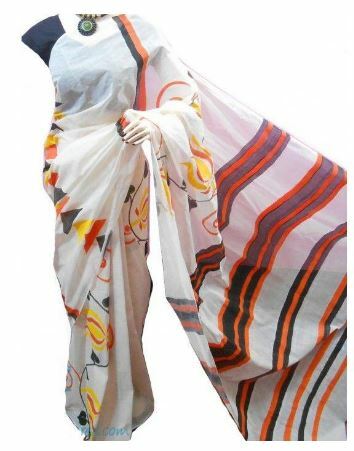 The charisma of one of the most feminine of colors has been used here to embellish the yoke portion of the saree to a great effect while the rest of it remains in white with very small little dots. The same floral blossoms, when seen on a rich tussar, takes on a different look altogether. 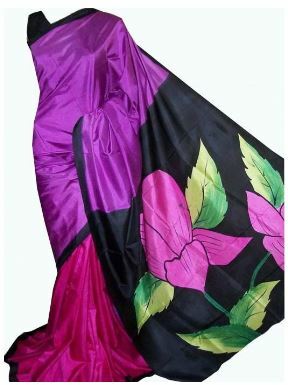 The fabric does play an important role in the final result of hand painted sarees. 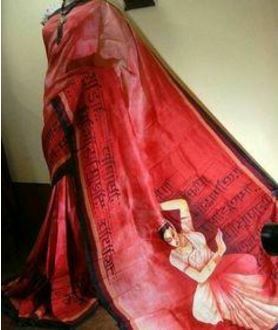 Mural sarees have an amazingly rich appearance, despite being painted on cottons and sometimes on silks. Here the rich definition and detailing of the deity, particularly the ornaments and the facial features, are the most classic part of the look. Anyone who understands the intricacy of fabric art will appreciate the amount of time, and the technique that goes into creating Kalamkari designs with the help of vegetable dyes. 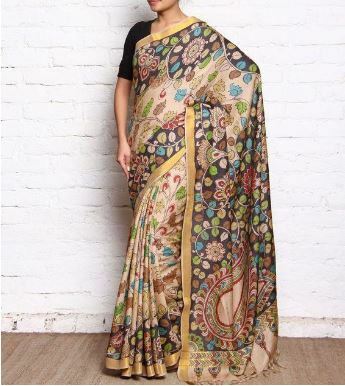 Here is a fabulous hand painted Kalamkari saree in silk bringing out the beauty of natural colors. 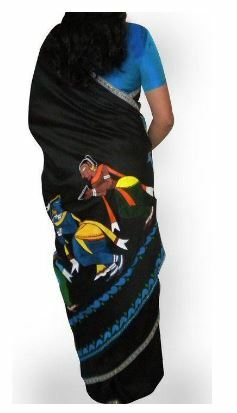 The art of life ordinary has been brought out by this folk art in the simplest of stick figure designs, that have been loved by all who have ever seen them, and what better way to make your saree get a whole new ethnic feel than with Warli tribal art! 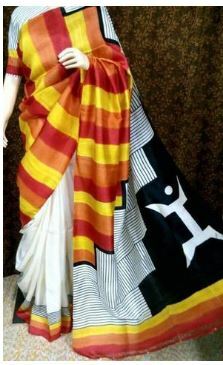 Well, not quite the states as in the book by Chetan Bhagat, as here the two are from neighboring states of Bihar whose example you can see in the Madhubani saree in ivory white silk , and the other from West Bengal, in the Kalighat style painted saree in black. While the Madhubani saree depicts scenes from the pages of the Ramayana, in the Kalighat paintings, one could see folk tales of Bengal and tales of Krishna. Perhaps the design that can take your imagination by surprise is the most artistic and innovative-the riveting patterns, though abstract seem to come together in a cohesive pattern. Here are three sarees each with a different color palette-some more intricate but none that could be called boring.